We can always use decals or transfers instead of painting our shields with a brush. 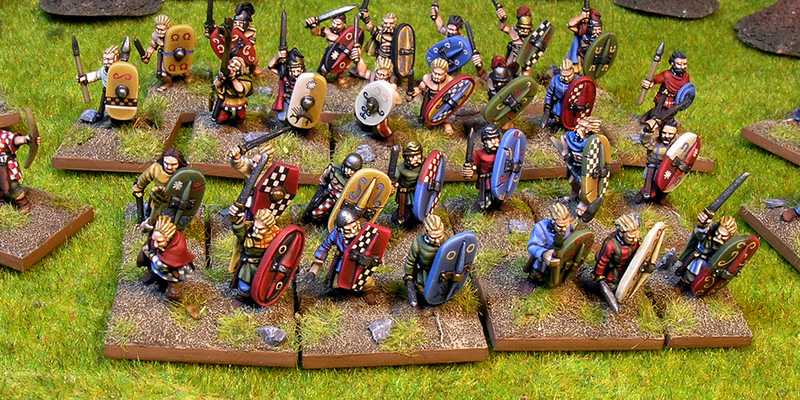 However, hand painted shields are always more impressive!. And it is very easy to do them. 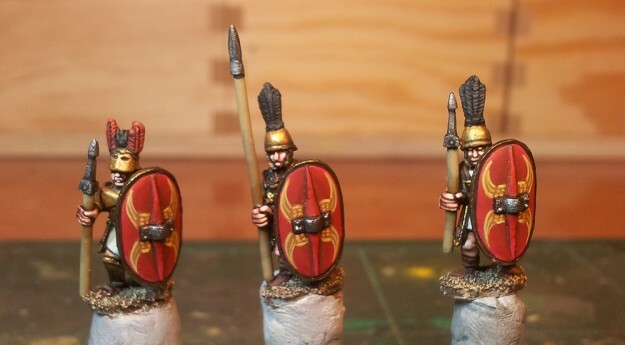 Although the previous picture presents a Gaul horde, in this tutorial (inspired by an article published in Wargames: Soldados y Estrategia nº14, by El Mercenario), I will show how to paint Roman shields with a easy symbol. Anyway, the base is the same in all cases. 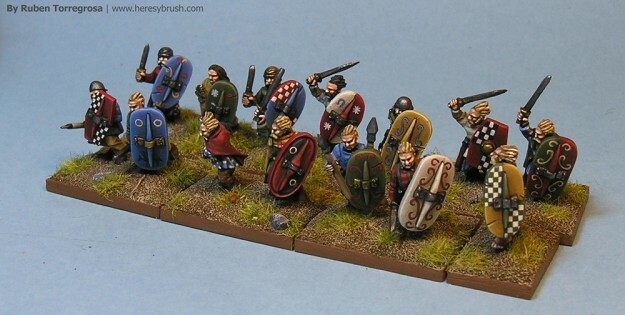 An these miniatures are from Forged in Battle, who are going to start a new Kickstarter to create a new range of Ancient miniatures. 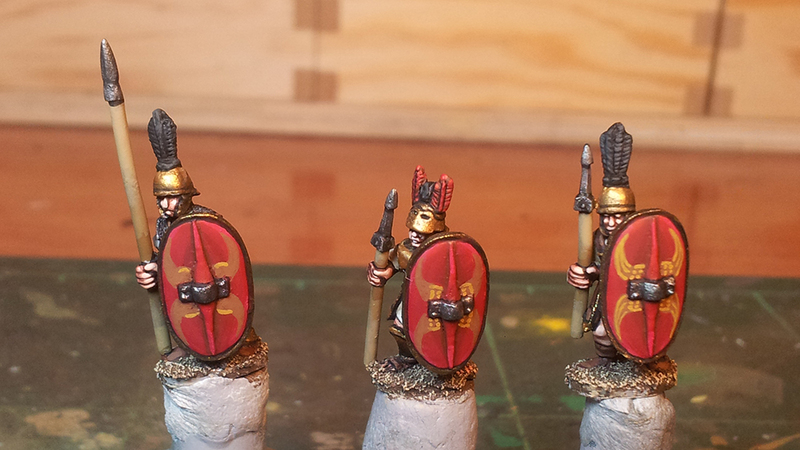 First, we have to paint the whole shield in a specific color. In this case, red, although there is a little controversy about this (we can find representations with white, blue or green shields!). Anyway, I love the red color in the Roman army. Therefore, I start using Cavalry brown (982, Vallejo), and then I apply lights with flat red on extremes (so the central area will be darker). We can apply a final light, mixing red with a little white. 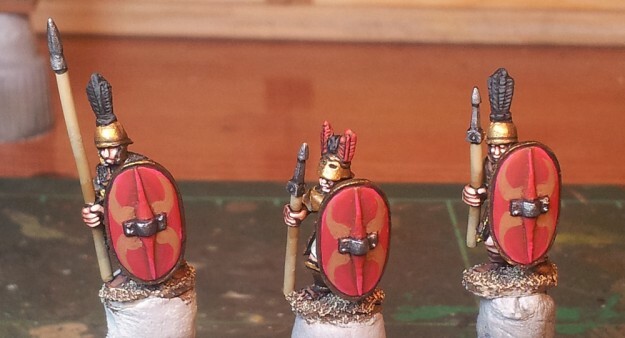 Then we can start painting the base or siluete of our symbol / draw. In this case, some kind of wings or similar. So, first we paint the silhouette with Beige brown (875, Vallejo). It’s recomendable to use a sharp brush!. Indeed I use a Winsor&Newton series 7, number 1. We paint an horizontal line in each wing (as you can see in the picture). We paint 4-6 small points in the wing bases. We paint 3 long lines from the base to the end. Finally, we can apply some lights in these details, mixing the Golden brown with white. These lights are very important to get more contrast. And remember, we can always re-paint all fails, so no problem!. Anyway, the most important factors when you are painting 15mm shields are two: a sharp brush and contrast. You need a lot of precision, so you have to use a very good brush with a sharpened tip. And the contrast is very important too, in order to attract the spectator attention, because the result will be more striking. Thanks for this useful and great post!